Have I beleaguered you with my undying love for picnics yet? Maybe we haven't known each other long enough. Adam, bless his heart, is extremely familiar with my love of picnicking. The first 70 degree day in the Spring. "Can we go for a picnic?" Driving by a park. "We should have a picnic there!" Random weekend afternoon with no plans. "Let's have a picnic!" I am annoyingly enthusiastic about it and will harass him until we make our picnic a reality. In the Boboli Gardens in Florence. On a beach on Lake Como. In Central Park in New York and the Golden Gate Park in San Francisco. To be honest though, I love normal everyday picnics just as much. Picnic food should be simple. The very best picnic meals, in my opinion, consist of some good cheese and crusty bread. In fact, if you brought me some good cheese and crusty bread and told me you wanted to take me on a picnic, I might love you forever. Salads are good too though, as are apples and strawberries, and maybe some chocolate for dessert. 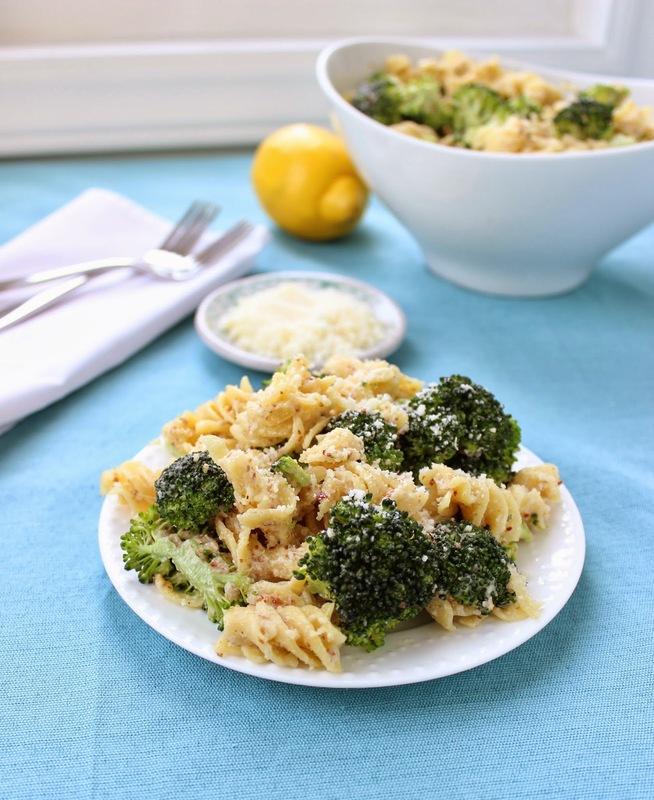 I wanted some bright, fresh flavors for our first picnic this spring, so I came up with this super easy broccoli pasta salad with almond pesto. The pesto is my favorite! It's simple a mix of almonds, lemon juice, garlic, salt, olive oil and parmesan cheese. 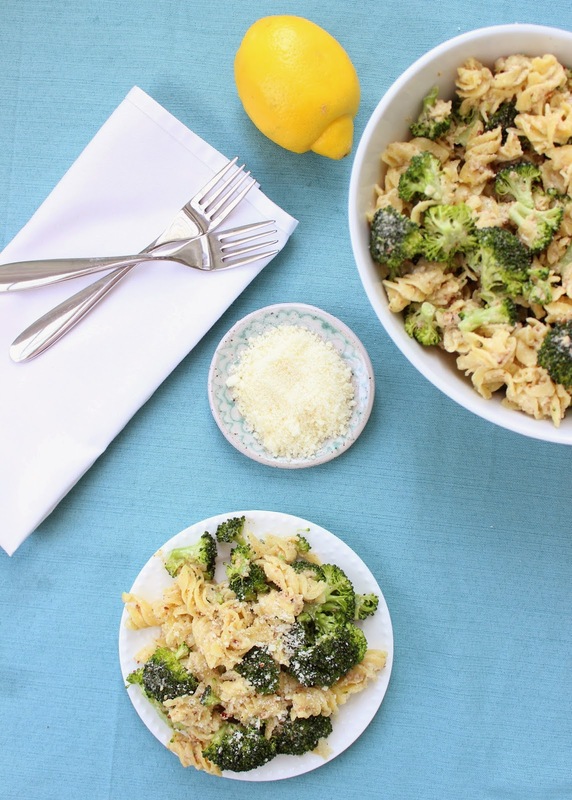 Simply give everything a whirl in the food processor and combine with some fresh broccoli and cooked pasta. You're ready to go! I had a picnic with my family this weekend and it was the best. I brought this pasta salad and my mom brought a salad with green beans, red onions, pecans and feta. My sister brought carrots and fruit and her dog Luna, who licked everyone's face like it was her job. I kissed Adam's face like it was my job too. He lives a hard life. Grab your friends. Grab your dog. Grab some bread and cheese or some of this pasta salad. Bring a blanket to sit on and some napkins and silverware and something to drink. Bring a book or a frisbee or a deck of cards. Leave your phone in the car. Then eat some food outside in the sun with some people that you really like and remember that life is good, and we are blessed. 1 large head broccoli, diced into bite sized pieces. Cook pasta according to package directions. Set aside to cool, rinsing with cold water if necessary. 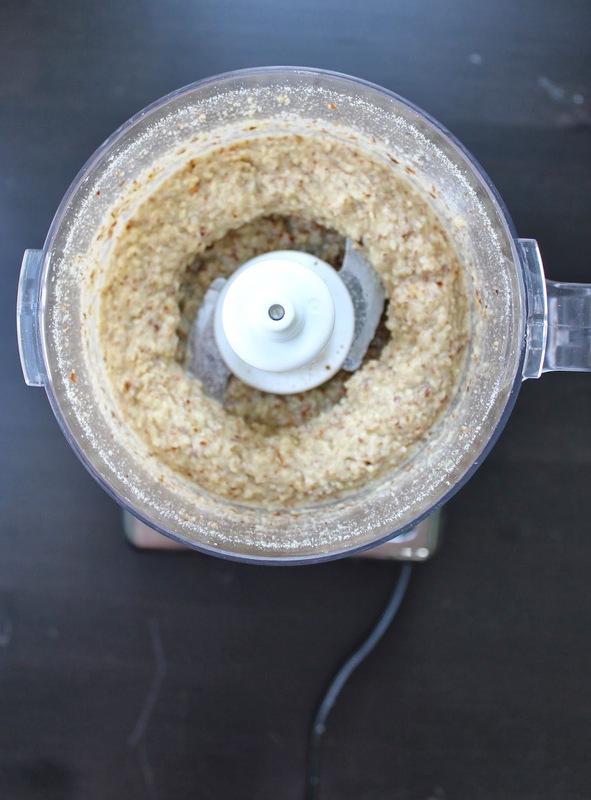 In a food processor, combine almonds, parmesan cheese, garlic, and red pepper flakes. Pulse until almonds are very finely chopped. Add lemon juice, salt and olive oil. Continue pulsing until mixture resembles a thick paste. Combine almond pesto, broccoli florets, and cooled pasta in a large bowl. If you find the pesto to be too thick, you can add extra olive oil or lemon juice. Taste and add salt & pepper as needed. I happen to enjoy the texture of raw broccoli, but if you don't, try blanching it. Toss the broccoli florets into boiling water for 1-2 minutes, then place into a bowl of cold ice water. The broccoli should still be fresh and bright green but softer in texture. I used this great quinoa pasta in this dish, so it's technically gluten free. Although sometimes quinoa pasta is really expensive, (like $5.99, yikes!) I found this brand for $2.99 at my grocery store. I'd love it if you'd share your favorite picnic foods and picnic places, wherever you live! I adore picnicking too Trisha, and that necessitates dragging the mister along, but I say it's for his own good. Who WOULDN'T want to spend a day outside with this pesto?? We are still no where near picnic season in NY, but I do like them in the summer. This salad looks delicious and I think the almond pesto would pair really nicely with the broccoli. Note to self - GO ON MORE PICNICS. As soon as spring really hits, it's happening. I love the sound of this pasta salad! So many fresh, happy flavors!